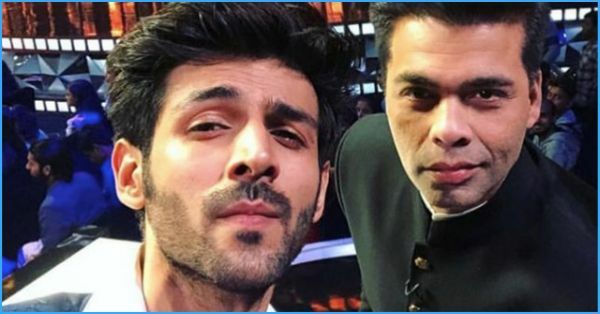 If reports are to be believed, Sonu Ke Titu Ki Sweety actor Kartik Aryan has been dumped from a Karan Johar movie, where he was playing the second lead along with Kareena Kapoor and Akshay Kumar. Rumour have it that KJo chucked him out because of all the wrong information his team supposedly spread. Apparently, his team told people that he had already signed the movie and was going to play the lead opposite Bebo, which wasn't the case. In reality, it was actually Akshay Kumar who stars opposite her. A source at Dharma Production told an online media portal, "Dharma sent Kartik feelers regarding a possible role, but it was nothing concrete. His team messed it up by releasing reports that the actor had been signed by Karan Johar when no such thing had happened. And if that was not enough, they also leaked the news that he was going to be paired opposite Kareena when she was actually paired with Akshay in the film." It's so sad that such a small mistake led to him losing a possible dream project in Bollywood. For his next movie, Kartik Aryan is starring opposite Kriti Sanon for Dinesh Vijan's Luka Chuppi and will also be playing the lead role in Kirik Party, a Kannada hit remake.